Leo muttered to me in Spanish, breaking my reverie. When I stared at him blankly he tugged my shoulder and pointed out the window. It was pushing midnight and it had been a long day – mostly spent watching Cyrano fill the trailer with plantains – I was a little bleary. In the gloom a truck lay upside down in a ditch. It reminded me of a dead dung beetle, it's tires pointlessly clawing the air. Staring as we drove past, Leo turned back to me and crossed himself. I looked out the window at the moonlit cliffs to my right and imagined what the alternative might have been. There was worse to come. We had woken early and César led us to a meeting point so we could start our trip back to Lima. The rendezvous was by the side of the road just outside town. Leo pulled up at the appointed time and we quickly loaded the mototaxi and took off. Over the next couple days and nights we made the snug little cabin our home. Leo and César swapped off on the driving, while Cyrano mostly slept in the mototaxi in the trailer We had acquired another passenger, Yelina, who was heading to Trujillo so space was tight. A little further down the road from the dead lorry was a "security stop." Leo slowed down in the darkness and then decided he'd flick off the banditos, three guys shouldering automatic weapons and wearing rent-a-cop Seguridad vests. I guess we could have been shot, but the thugs had their hands full with other cars and Leo wasn't about to stop anyway. This was the same highway Zaya and I had come down two days before. Now I understood the pericoloso the officer spoke of when as we headed down the mountainside in the dark. César leaned forward and asked me if I wasn’t afraid of getting assaulted. I said, probably not. We are so far off the profile of a typical victim, I reasoned, these bandito's probably (hopefully) wouldn’t have the presence of mind to rob us. We were betting it would take them several minutes to even remember why they stopped us, by which time we'd charm our way out of trouble. Thirty minutes later César drove while Leo snored and I catnapped. Around 5:00AM Leo took the wheel back. As we headed down the final face of the Andes towards the coast, Leo started talking about an accident. He pointed out a break in the guardrail and as we came around the switchback we looked for wreckage in the dawn's twilight. My assumption was the accident occurred a while ago, but it was all over every newspaper’s front page in Chiclayo that morning. 22 people were killed, including several children. Leo thought the driver had fallen asleep, but the papers weren’t as clear. 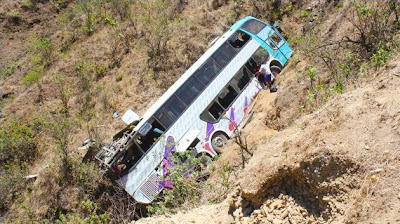 Bus crashes like that aren’t uncommon in Peru, some 5-6 every year, each one making headlines. And even though the wreckage had been cleared, it was the worst part of the night.